We welcome people from all nationalities and cultures to Everyday English classes. It is an opportunity for the St Andrew’s church family to connect with the local community. Our ‘Everyday English’ programme is designed to increase competence in English conversation for day to day interactions in the community. Students are assigned to groups based upon their ability level from those with no English to those wanting to practice conversations at an advanced level. Our teachers have completed the Anglicare training course and are committed to providing relevant, student focused lessons, in a friendly and non threatening environment. Classes are held during term time from 10am to 12pm in the church foyer. 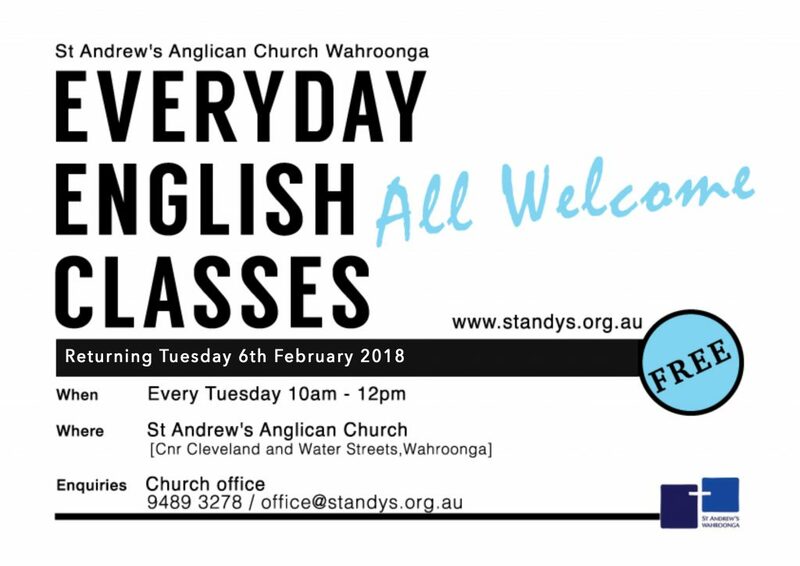 If you’d like to know more or organise your first visit, please contact the church office on 02 9489 3278 or office@standys.org.au .